Today I started my morning off with taking a green monster into work that consisted of: soy milk, fresh spinach, 1 banana, scoop of Hammer Vanilla Soy, spoonful of chia seeds and ice. Oh and the new issue of Runner’s World came, I need to get to reading that. Anyone move to iPad for Runner’s World? Pros/Cons? Can you keep back issues as long as you want or do they expire? I’m half tempted to just get our subscription electronically in the future. 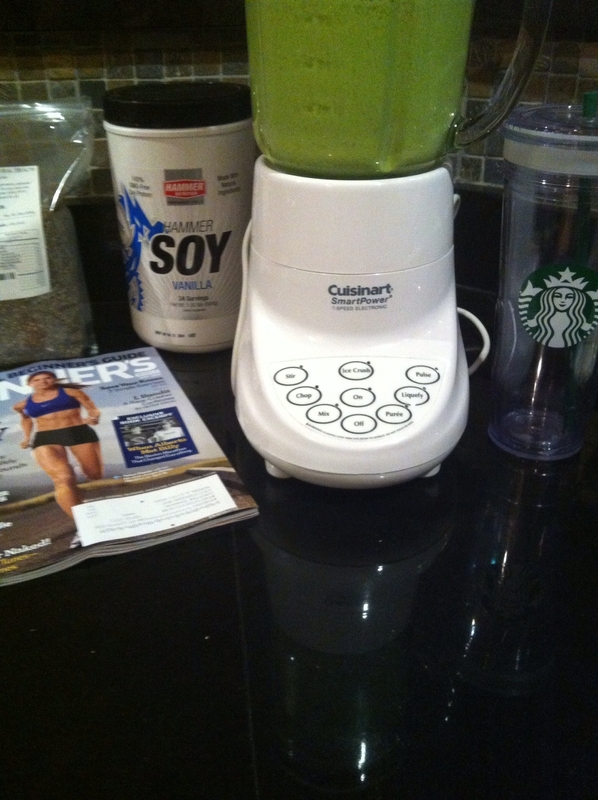 It just felt like a green monster day since tonight I had a new type of training session. Since my stomach is feeling better I will be participating in a training program called Team Steam that is for the Steamboat Classic 15K in June. The 15K is notoriously difficult and has a big hill climb that is done twice during the course. I’ve ran this race for three years without any hill training let alone on the actual course. My hope is that the hill climbing will help me get some of my strength back and help my running overall. It will also be nice to hopefully be more prepared for Steamboat. I will have to be mindful that I’m not in my old race shape and I tend to have piriformis issues after a hilly course because of my lack of training on hills. I will push myself, but have to just make sure I keep on top of any issues that arise from such a change in my training. Team Steam will be Tuesdays and Thursdays up until race time. I should be able to make most of the days and only plan to miss while we are away for Boston. I will have to leave work, change into my gear and drive 40ish minutes to the training location. 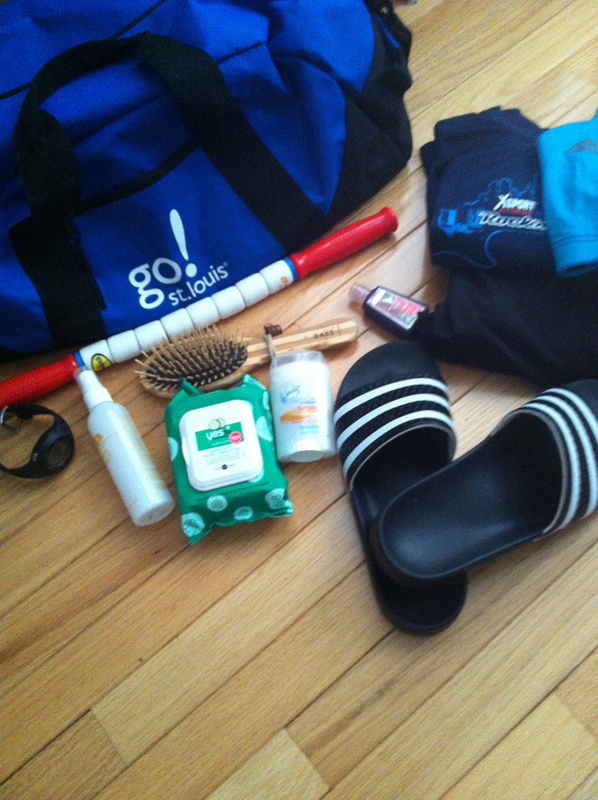 I will also make sure to pack a bag in case I need anything or the weather changes, really much packing for a race. Drew will also be running in Team Steam so we met up ahead of time to run 3 miles as a warm up. It was 80 degrees and 80% humidity because a storm was coming in. Shortly after our warm up the organizers of the program explained that tonight’s run would be a time trial of a 5K-ish. It wouldn’t be chipped timed or anything and the start/stop was general so it wasn’t an exact science. The start was congested. They had about 50 of us squeezing on a bike trail which caused a bottleneck for almost a half mile. I was able to break through the crowd and get going just before mile 1. Halfway to mile 2 and we hit the first hill and my legs melted without any training. I was able to get back into it afterward and was able to pass all the women but one, making me second in. I’m happy with getting a race-type atmosphere to try to wake my legs up. I know I have a long way to go to get my fitness back, but it felt good to push myself. The eminent storm was coming in with lightning and rain so Drew and I left right after we finished. I can’t wait to go back Thursday! Maybe I should just buy one issue on my iPad and see what it’s like. Yeah starting over stinks, but it will be better when I finally feel some of it coming back. Dang- I don’t have a runner’s world subscription right now: I love fresh editions! I don’t have an ipad but even if I did I would get the paper one. I like tearing articles out and taking it to the gym etc. Good point, there is something about having a magazine to take places that you don’t have to worry about it like the gym, pool, beach, unlike my iPad.